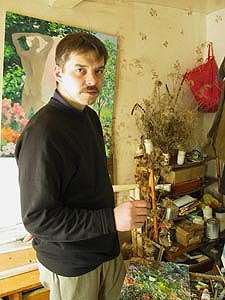 Konstantin Matvienko was born in 1969 in Krasnokamsk, Perm region (Russia). Graduated from the Krasnokamsk Art school and Sverdlovsk Art College. At present lives and works in Berezovskiy, Sverdlovsk region (Russia). His works are presented in private collections in Russia, Europe and USA. 1994 - "Jubilee" (Kamensk-Uraliskiy, Russia). Collective. 1996 - Exhibition in the Artist Union hall (Ekaterinburg, Russia). Collective. 1997 - Zonal exhibition (Ufa, Russia). 1997 - Personal exhibition "My nature - my soul", Ekaterinburgskiy museum of graphic arts (Ekaterinburg, Russia). 1998 - Exhibition, House of the Peace and Friendships (Ekaterinburg, Russia). Collective. 2000 - Personal exhibition (Berezovskiy, Russia). 2002 - Personal exhibition "On the eve Cristmas", House of the Peace and Friendships (Ekaterinburg, Russia). 2002 - Personal exhibition (Ekaterinburg, Russia). 2004 - Exhibition "In expectation of miracle", Art gallery "Pararam" (Ekaterinburg, Russia). I present to your attention my latest paintings. In them I have expressed the beauty of the nature, mystery of the instant, flight of the soul. In these paintings is my life, for which I am thanked the God. I will be lucky if in your hearts remain the part of my warmth. Wish You kind and love. "